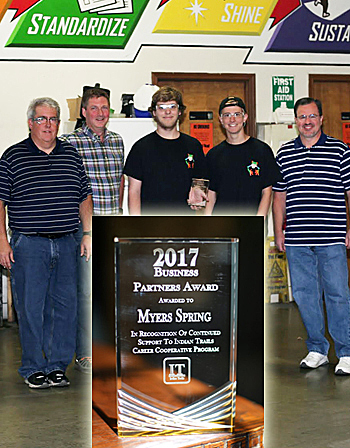 Myers Spring Company of Logansport, Indiana was recently recognized by the Indian Trails Career Cooperative Program as a Business Partner for hosting two interns from Carroll High School, Carroll County. The objectives of Indian Trails and Myers Spring converged nicely when Bradley Brummett, who will be attending Purdue University this fall, and Andrew Hartman interned at Myers Spring for 4 months in 2017. Brummett and Hartman were exposed to CAD, PLC programming and many more aspects of modern manufacturing. They completed several valuable projects in the process. Tyler Sausaman, a Carroll High School teacher, nominated Myers Spring for the award.